OK, I'm convinced the only reason this highway was built was to upstage I-985 in Georgia. Still, it's way cool, the highest Interstate number out there till they hit 1080 or 1005 in California. SB at the south end of the road, first photo courtesy Doug Kerr. 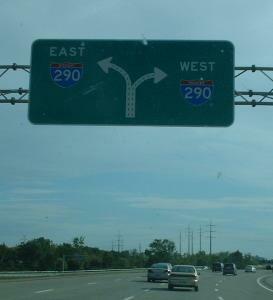 You can see where the second photo is, the only button copy left on either I-990 or I-290. 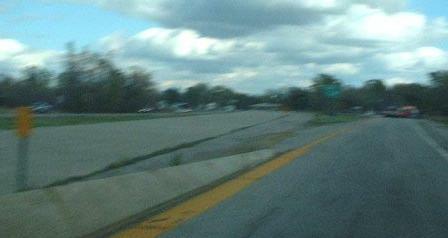 Another ramp in the I-990 interchange. I think, because this is the terminus of I-990, that all of the ramps would qualify as the actual Interstate and not "TO", but you can't get that specific in a little generic sign. On Audubon Pkwy. in the University of Buffalo, courtesy Doug Kerr. 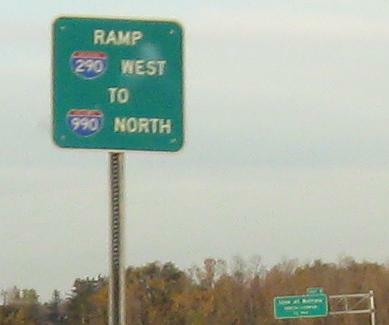 NY 263 runs northeasterly out of Buffalo, and this sign could be pointing to either Exit 3 or Exit 4. Not Exit 5, because that's the current end of I-990 at 263, so this wouldn't say TO. Courtesy Doug Kerr. NB at the north end of the road, first photo courtesy Doug Kerr. This stub's status is "active" - I-990 is meant to be continued as far as traffic counts warrant, should NY 263 ever get congested north of here. Really, that's unlikely to ever happen. Looking back south from there.